The manmade disaster began the same day, as the tsunami swept over the seawall of the Fukushima Daiichi Nuclear Power Plant, flooding the facility and destroying much of its equipment, including its onsite emergency power generators. Cut off from all external power sources, the reactors and spent fuel-rod assemblies began to overheat. This is their story, based on extensive interviews with the people who fought and won that battle, and especially with Masao Yoshida, the man who drove them all to get the job done. Soon to be a major motion picture starring Ken Watanabe and directed by Setsuro Wakamatsu! The cover of the original Japanese edition, entitled "死の淵を見た男 吉田昌郎と福島第一原発の五〇〇日." That could be translated as something like "The Man Who Looked into the Abyss of Death: Masao Yoshida and 500 Days at Fukushima Daiichi." English-language newspaper The Japan Times reviewed the Japanese-language book <here>, in English—one of the few non-English books they have covered. "What this book does so well is expressing the great but quiet heroism of all those who kept going in spite of personal danger and immense difficulties to minimize the danger to others." "Although the book is nonfiction, it could as well have been a thriller." "The book covers the first week of the disaster from the perspectives of a handful of employees. The author does a good job of describing the tension and confusion at the site, as radiation levels rise and supplies dwindle. It didn't come off as overly melodramatic. This book doesn't tell the whole story of Fukushima. That isn't its intent. This adds dimension and background to a complex story. "Thankfully, there was no need to worry. While the technical aspects are an important part of both the story and the book, they are explained thoroughly and used to enhance understanding of the human drama, not detract from it." The original best-seller was in Japanese and as the English readership is global, this is certainly the second, big 'release' of this work. 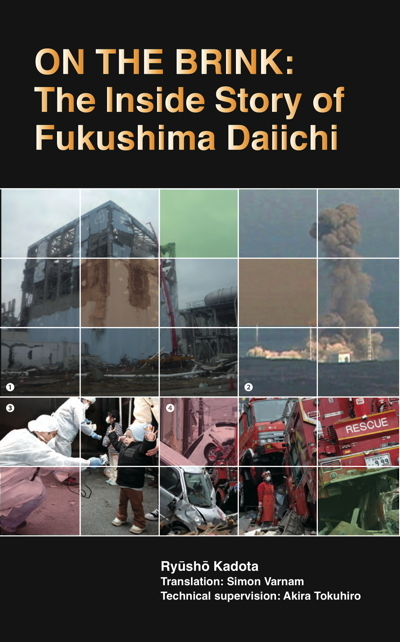 In English, and with technical 'care', this is a hopefully insightful accounting of the events - the history and the devastating 'end' of the Fukushima Daiichi Nuclear Power Station (NPS). On the Brink is a record of what human strength when applied to Herculean tasks can overcome. The main characters [...] were ordinary men who performed their jobs under extraordinary demands while the world watched anxiously. Problems needed immediate answers. Could standard procedures be applied? Where could they find resources? How much worse could it get? ... This book is also about human error. Now available as an e-book from major etailers including Amazon Kindle, B&N Nook, and Apple iBook. was born in Aki, Kochi Prefecture in 1958. After graduating Faculty of Law at Chūō University, entered Shinchōsha as a reporter at the Shūkan Shinchō weekly magazine, rising to assistant editor. After 7 years as a roving reporter, he wrote almost 800 articles during the 18 years he spent in the magazine's offices. He went independent in April 2008. As a non-fiction author he is active in a wide range of genres including politics, law, crime, history, and sports, and has penned numerous books. The Man Who Saved Taiwan: The Miracle of Lieutenant General Hiroshi Nemoto of the Imperial Japanese Army (Kadokawa) was awarded the 19th Yamamoto Shichihei Prize. Other major books include Kōshien Legacy: the Life of Legendary Batting Coach Michihiro Takabatake (Kōdansha), Battle Against Despair: The 3300 Days of Hiroshi Motomura (Shinchōsha), Last Testament of the Pacific War (3 vols., Shōgakukan), and Defanging the Wolf: The Tokyo Metropolitan Police Public Security Bureau and the Most Dangerous Bomber in Japan (Shōgakukan). Kōshien Legacy was dramatized by NHK as "Full Swing," starring Katsumi Takahashi, and Battle Against Despair was dramatized by WOWOW, starring Yōsuke Eguchi, winning the Grand Prize in the drama category at the National Arts Festival hosted by the Agency for Cultural Affairs. His most recent work is The Reporters Headed toward the Sea: The Tsunami, Radiation, and the Fukushima Minyū Shimbun (Kadokawa). Kadota is continuing his dynamic writing in a wide range of fields. Akira Tokuhiro is a Professor of Mechanical Engineering and Director of the Nuclear Engineering Program at the University of Idaho. He joined UI in 2007. He was previously on the faculties of the Mechanical and Nuclear Engineering at Kansas State University and the University of Missouri-Rolla (UMR). He was also Director and licensed Senior Reactor Operator of the UMR Reactor. He has diverse research interests centered around reactor engineering, design and safety, thermal hydraulics, experiments and measurement, modeling and simulation of complex systems. He served on the American Nuclear Society's President's Committee on the Fukushima Accident from 2011-2013. Dr. Tokuhiro has 10 years of international nuclear energy R&D experience in Switzerland and Japan. To date he has published 50+ papers, 80+ conference papers and produced nearly 40 MS and PhD students. Although born in Tokyo, he was educated in the U.S.. He holds a BSE, 1981, Engineering Physics, Purdue University; MS, 1984, Mechanical Engineering, University of Rochester; PhD, 1991, Nuclear Engineering, Purdue University. He can be reached via LinkedIn.